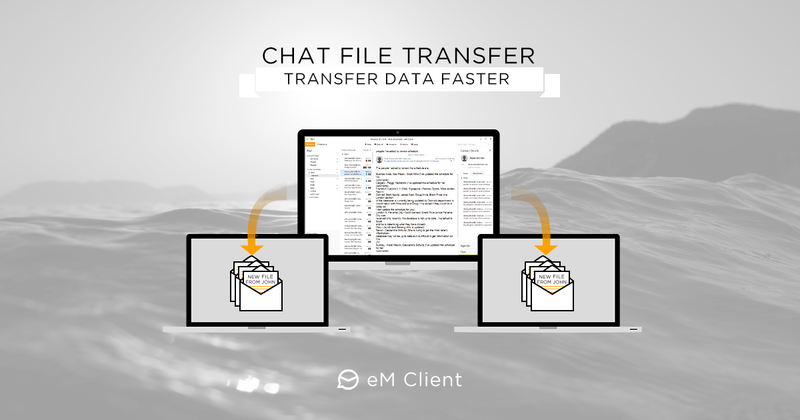 As you may know, transfering files with eM Client is already possible with the current release. However we're improving most of the features for the new version 7 and we've taken a proper look on our chat feature as well. The new version already includes the new Is Typing feature that we've announced a couple weeks back but what is there more to chat? We've reworked the file transfers to simplify your work with attachments. File transfers are now quicker, more reliable and have an updated look with the new UI. Use the feature to share data with people in your group quickly and get your colleague's feedback before you submit the files to customers (or your grandma) or just use it for general blabber as we do.